Here on the island of Manhattan we are gearing up and battening down in anticipation of the arrival of Hurricane Sandy. Who knows what the storm will bring -- will it be Frankenstorm, the epic storm for the history books? Will it be just a lot of water from all angles? Will we lose power? Meanwhile, I am delighting in a little gift-bag goodie I received two weeks ago at the annual meeting of the Federation of Alliances Francaises in the U.S. A number of corporate sponsors had interesting (or frivolous) logo-stamped tchochkes. But none were more timely or more potentially helpful right now than TV5 Monde's gift of a solar-powered phone charger. It's warming up by the window. I adore watching French TV in the US via TV5, and this is another reason to love the company. 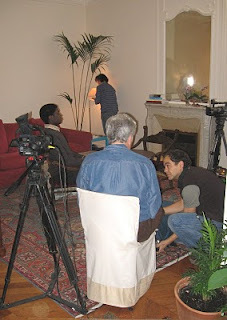 I'm often asked "What did you do when you lived in Paris?" Ouf. The answer is, to opt for an oft-used phrase, "It's complicated." I did some free-lance consulting, editing and copy-editing, and of course I created and fed this blog, my third child. But one of the most fun, intriguing, and personally fulfilling volunteer gigs I had in Paris was to be a part of the Lafayette 250th anniversary celebration a few years ago. Bright lights! Big city! Cameras rolling! It turned out that a big part of the Lafayette anniversary woop-de-doo was of serious interest to acclaimed American filmmaker Oren Jacoby. How he and I initially connected is too long a story to be of interest (it has to do with librarians, historians, and archivists, so don't fall asleep). 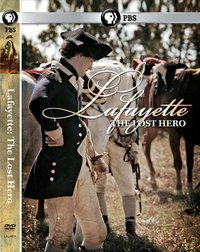 But ultimately, I ended up as an enthusiastic, starry-eyed participant in Oren's great documentary about the Marquis de Lafayette and his involvement in the American Revolution: Lafayette, the Lost Hero. 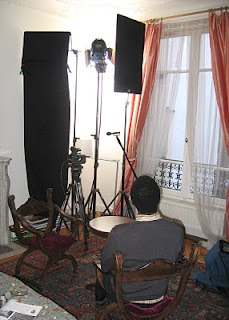 In Paris, I was filmed tootling around the Marché de Saxe on my bike, climbing the stairs at the French Senate (the Palais du Luxembourg) and at a gala at the Palais de Vincennes, interviewing the director of the Musée Carnavalet in private tour of the museum's galleries, just to name a few segments. My then-college-aged kids agreed to be filmed as I lectured them about the "Declaration des Droits de l'Homme" in the Concorde metro station. I counted among my Lafayette co-stars such journalistic luminaries as Michael Oreskes and Jim Gaines, plus the mayors of Lafayette cities in the US. On the other side of the pond, too, I was there. Back on home turf to see my son Harry, I plodded around the Bunker Hill monument in Boston in the rain, cameras running as I chatted about Lafayette history. In Charleston (while on a visit to Miss Bee in college), I learned a lot about South Carolina history as we focused on Lafayette's arrival there in 1777. All for my hero, Lafayette. And a plus: I learned a lot of film lingo. Such as "sticks," and "wrap." You know, how cool am I? Heady stuff. Here I am with the great guys of the crew, South of Broad in Charleston. Sometimes I felt like Snow White! But how do I put any of this on my resume? Trick or Treat, Parisian Style? Are you tired of the same old same old to hand out to trick-or-treaters on Hallowe'en? Do those pound-and-a-half bags of mini Snickers, Mounds or Mr. Goodbars make you yawn (or stress from the conviction that you will. not. open. that. bag.)? Are you a francophile who yearns to convey a sense of French culture and refinement to all those goblins and princesses and Where's Waldos who ring the doorbell? Oui, oui, you say? Here is your dream come true. Voila! 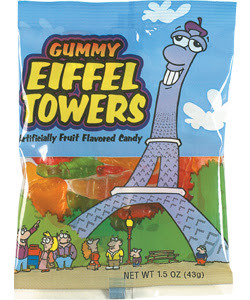 Eiffel Tower gummy candies. You can order them here. And yes, indeed,I have taste-tested them for you. I received them in a goodie bag recently at a French conference. Okay, all right, I finished off the whole packet once I got home. Labels: cuisine, francoFiles, made me laugh, where am I? I just commented to a friend on Facebook, "I used to sleep with my Bescherelle under my pillow the night before French exams." And -- whoosh! -- a Proustian slew of ancient memories rushed in. Le Bescherelle, my saint, my foe, my best friend, my nemesis, for so many years of studying French. The slim, ever-solid volume in familiar red, slightly rounded at the corners from years of use and abuse. 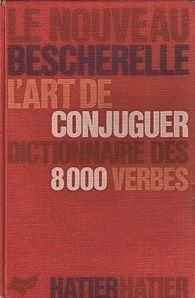 In it: the art of conjugating over 8,000 French verbs. The Bescherelle: it bolstered me, intimidated me, confused me, reassured me as I tried to master the intricacies of the subjonctif, the passé simple, the plus-que-parfait. And that was what I called it -- mon Bescherelle. Yes, it turns out that "Bescherelle" is considered a common word in French, just like Kleenex or Band-Aid in English. Do we have an equivalent for a such grammar and language bible in English? Maybe "my Strunk and White?" I still have my original Bescherelle, somewhere deep in storage. (With all my books; long story.) I think it was a required purchase in 10th or 11th grade. Long after donating my French-literature survey and other textbooks to rummage sales, my beloved/despised Bescherelle remains as much a part of my permanent library as my Webster's 7th Collegiate or my Petit Robert. And Bescherelle is now also very 21st century, I'm glad to see. Check out bescherelle.com for immediate on-line answers on conjugation of French verbs, and much more. P.S. My newly-discovered secret French-geek spelling fun activity on bescherelle.com is to do the middle-school level dictées. My scores are pas mal. And it's free! Driving down a back road in Rhode Island last weekend, I spotted a neon-green poster, hand printed, which announced: HUGE barn sale! What could I do but swerve and follow? After finding the place, I wound my way to the back of the house to the ersatz barn/shed. Blessedly, the sale had no contemporary knick-knacks: no legos or Candyland games, no outgrown plastic tricycles. Just an authentic assortment of dusty treasures hauled out of the barn and spread out on planks and sagging wooden tables. A vintage bicycle, with flat tires and rusted gears; several Flexible Flyer sleds, perfectly aged; old tools with a respectable patina of rust; a collection of odometers from 1950's vehicles. That sort of barn sale. Heaven. On the middle table, under a pile of tin items, I found this plate, caked in dirt. "How much?" I asked the owner. "What is that, Italian?" he asked. "Nah, actually, I think it's French," I replied, with a forced (but hopefully convincing) note of disappointment in my bargaining voice. "Okay, well how about a buck?" I poked around among the sundry ancient items some more before shelling over my dollah for this lovely bit of French faience. I knew it wasn't a priceless gem, but somehow the design, as an old-fashioned French bit of tableware, appealed to me. And the colors were so autumnal. As with all random purchases like this, I get to wondering how it found its way from the Hamage Moulins des Loups Nord factory in France, where is was created, to this little hamlet near Newport, Rhode Island. And where was the rest of the set? Couldn't you write a novel just about the journey? Labels: classic france, French traditions, history, shopping, where am I? This is my first ever book giveaway! In the past I have been supplied with books to read and review upon occasion; but this time the generous folks at Simon & Schuster have sent me an extra book to offer to readers of Polly-Vous Francais? in a Book Giveaway! And this is not just any book. 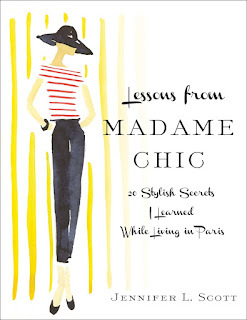 It is Lessons from Madame Chic: 20 Stylish Secrets I Learned While Living in Paris by Jennifer L. Scott. Okay, well, damn, I thought when I first heard about this book. Or "Sniff!" as I wrote to the lovely Simon & Schuster publicist who offered me the advance review copy, "This was the book I was going to write," I whined. "Oh well, she who hesitates... blah blah." So I swallowed my pride (and that half-written manuscript) and eagerly agreed to read the book and offer a book giveaway on ye blog. Mardon me, Padame, but how the h** does one do a book giveaway? Of course one googles the phrase "Book Giveaway" and then picks from the best of the ideas and marches onward. And so I present: the Polly-Vous Francais first-ever book giveaway! Are you still awake? Would you like a free book? If you'd like to learn how to be chic like the French women in this book, and get a free book which gives you all the details, simply leave a non-spam, non-anonymous comment below. And while you're at it you can "like" our Facebook page! I will print out all the names and cut their email addresses in little strips of paper and then place all the names in a beret before November 6 (the release date of the next edition) and then I will ask a random friend to extract the names from the beret. Then the winner, selected at random, will be contacted. Said winner will have to have enough confidence that I am not an axe-murderer to give me her (or his?) 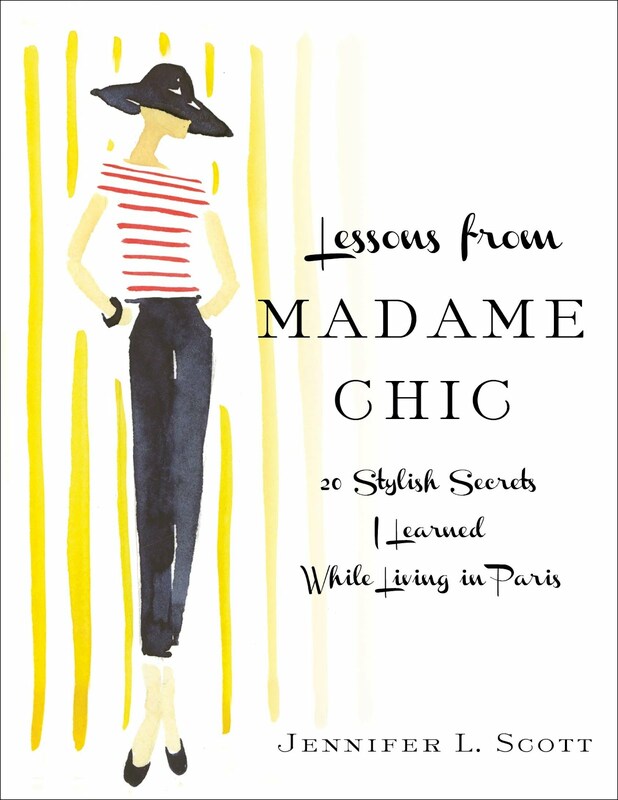 mailing address, and then I will send that winner a pristine copy of the wonderful Lessons from Madame Chic. And I'll actually pay the postage. And I actually promise to put it in the mail, unlike most of the other letters on my desk which have been languishing in the "to be mailed" pile for lo these many months. But don't stop reading yet. You need the preliminary review! Lessons from Madame Chic arrived in this afternoon's mail. And I can't put it down. It is a fabulous look at French savoir vivre. Jennifer Scott never attempts to generalize or make stereotypes, but simply offers one view of chic French life as she observed from a year living in Paris with Madame and Monsieur Chic in the 16e arrondissement. She balances it with great observations about Madame Bohemienne in the 11e. No broad-brush "the French are this or that" statements, but simple and astute observations from her year in Paris. I think perhaps some cultural/social evolution has happened since the author first spent her junior year in France (most chic French women now wear jeans? ), but this book is nevertheless a great resource, with helpful tips on how to incorporate French chic and practicality into your everyday life. In every realm from fashion to food to family living to feeding your brain, with chapters such as "Exercise is Part of Living, Not a Chore." You'll be glad you read it. And I think you'll keep it on hand as a reference book. So, my friends, submit comments below (and "like" us on Facebook for a plus) to qualify to win a free copy of Lessons from Madame Chic! Comments (or new Facebook "likes") must happen before November 5. The winner will be informed by November 6. Breaking news! This weekend, historian and author David McCullough announced -- for the first time to the public -- the subject of of his next book: Americans in Paris from the early 1900's to 1930. The theme, though, will be fascinatingly different from all other tomes on those all-too-famous Yanks in the City of Light. His will be a study how the nascent technology of aviation influenced their lives and vice versa. Speaking at the annual meeting of the Federation of Alliances Francaises in Providence, where he was receiving the coveted Prix Charbonnier for his most recent work on Americans in Paris, The Greater Journey, Mr. McCullough unveiled his latest project. 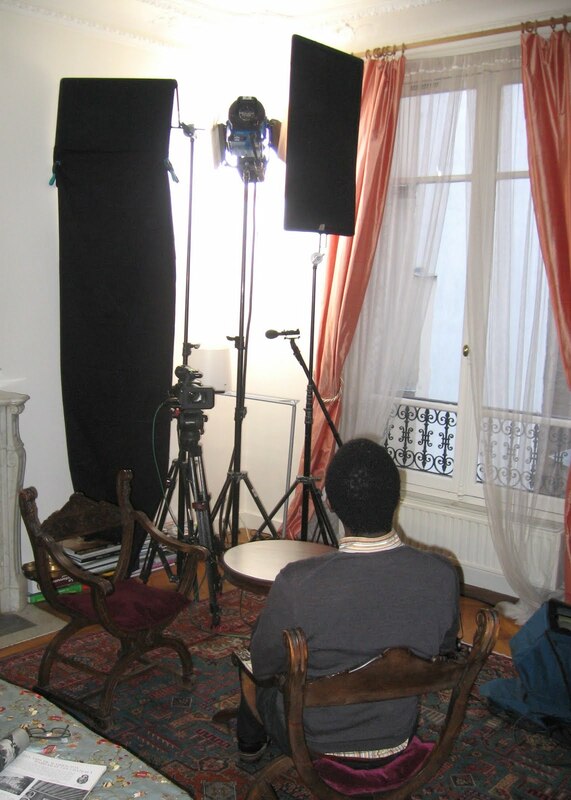 Realizing, in Paris during a 4-day taping for 60 Minutes, that writing about Paris was in his heart, he knew his next book also had to be about Americans in Paris in the 20th century. "But," he said, "I was faced with the problem of 'How can I make it different from so much that has been written? I cannot go down the same old path about Hemingway, Fitzgerald, and Gertrude Stein, etc. etc.' I knew it could be done and I knew that there were so many more people than those clichés that they had become, alas. But what would make it work? And inform? What was the perspective or lens through which I could look at this period that would be different? And then, one day, came one of those moments where suddenly it hit me. And, honestly, it just lifted me out of my chair. And that is: aviation. The advent of flight. The advent of the airplane. The most emblematic development of the 20th century." Here is a brief glimpse of him reading the first page of his new book, describing Edith Wharton in Paris as she witnessed the first airplane to ever fly over Paris,on Monday, October 18,1909. The video is truncated, alas. I had to focus on the talk. Page one had me completely spellbound. Afterwards, Mr. McCullough said to me, "Well, Polly, if your face was an indication, I guess it will be a hit." The season of the vendange, the autumn grape harvest, is winding down in France. Which reminds me. Have you ever seen one of these? Whenever visiting friends asked, "What totally-unique souvenir shall I take home from France?" I marched them right down to BHV. To the beloved basement, warehouse of All Things French. To stock up on these French corkscrews for their friends and family. One reason? This is literally a piece of France: wood from old French vines transformed into a corkscrew, called a tire-bouchon cep de vigne: literally vine-wood pull-cork. Another reason: each corkscrew is unique, for obvious reasons. Created by artisans. One aspect of the appeal of the tire-bouchon cep de vigne is difficult to explain until you have one in your hands: the heft of the thing feels right, and the curve of the vine in your hand makes you feel like opening a bottle of wine is a bit of a ceremony. Which, of course is as it should be. Today I did something I've never done before. I bought a charm for a charm bracelet. Not just any charm, but a silver miniature Eiffel Tower. I found it in a bowlful of charms for sale at an Upper East Side rummage sale, and it was perfect inspiration for a project that has long been on the back burner: to transform my childhood charm bracelet, and update it into a necklace. When I was 12 or 13, my father gave me this sweet silver charm bracelet. A horseshoe, for good luck, with my birthstone, a garnet, which has long been missing. The great state of Tennessee, where I spent my early childhood. A cruise ship, for the transatlantic trip our family took when I was five, ultimately arriving in Beirut to spend a year in Lebanon, where I learned my first French. An airplane (don't you love the propellers?!) for all the shuttling back and forth between parents that made me an ace traveler at an early age. This bracelet has been relegated to my keep-forever jewelry box, but never worn in many, many decades. I don't really wear much silver jewelry, and noisy tinkling bracelets on my arm are so distracting. BUT. I've seen a few charm-bracelet necklaces with mixed gold and sterling charms and found them to be ... charming! So next all I need to do is to find a gold (fill?) chain like this at an appropriate length, and then add meaningful charms as I find them. I've already decided not to use any charms with enameled color, but to stick with gold and silver. And now I have my Paris charm -- the Eiffel Tower. Yes, a cliche, but so much more delicate than the Arc de Triomphe. Right? What do you think? Any advice? I don't even know how to remove and add the charms. I am a total novice in the jewelry-making hobby. I need help for charm school!